Can occasionally drag, but is a mostly funny and intelligent puzzler that may improve your lexicon to boot. Scribblenauts Unlimited... isn't. Unlimited, that is. For the uninitiated, the Scribblenauts series is a family of cutesy side-scrolling puzzle games with an impressively comprehensive knowledge of the written word. Puzzles are solved – as they are in Unlimited – by summoning objects via simply typing the appropriate noun. No matter what you jot down, chances are (unless it's copyrighted, or in some way related to phalluses) it'll be recognised and manifested right in front of your cartoon face. "Disappointingly, puzzles have specific solutions that rarely encourage experimentation." That's a very cool hook, but despite the name, the inclusion of effects-granting adjectives and an ever-growing in-game dictionary, Scribblenauts Unlimited isn't endless in scope. Most objectives are miniscule, five-second fetch quests, wherein an NPC details something they want and you immediately serve it up with a magic notebook. There are hundreds of these; some are so easy I completed them by accident, as creations from previous encounters clattered into each other to the satisfaction of an unknown win condition. The disappointing bit is that they all have specific solutions that rarely encourage experimentation. Some even fail if you complete a task in the 'wrong' way, such as the glacier that can't be broken or melted “with science”, which I failed after employing the unacceptably scientific method of hitting it with a big hammer. Luckily the more substantial missions are far more accepting – demanding, even – of lateral thinking. It's here that Unlimited proves its sandbox credentials. In one section, you're tasked with defending a desert town against marauding bandits. The game tells you to build a wall and prep the townspeople for sword-to-sword skirmishing, but there's nothing preventing you from deleting the barriers, carpeting the approach with mines and blasting away raiders yourself. "Maps dotted with random junk, people, and things lead to some wonderfully weird scenarios." The ability to self-author solutions doesn't just make the larger puzzles more satisfying, it also tends to leave the maps dotted with random junk, people, and things, which can lead to some wonderfully weird scenarios. Can you ride a whale while toting a harpoon gun? Of course you can. Who'd win in a fist fight between God and the Devil? Lucifer didn't even get to throw a punch. At one point, a magic mirror I'd created produced a parallel version of myself, who compounded the mess I'd already made by spawning his own pile of assorted doodads, including an angry shoe and a forlorn-looking 5th Cell developer. 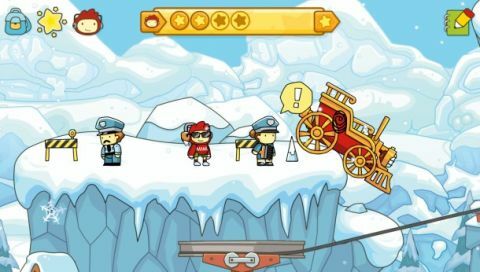 Ultimately, Scribblenauts Unlimited's biggest problem is that it can never live up to its own title – random tomfoolery won't add too much to the brief six or seven hours it takes to finish the story and complete all the main challenges. Still, I'd bet the pile of gold I've just typed into existence that you'll spend much of that time with a genuine smile on your face.